This page provides the information needed to upgrade an existing APPX 4.2.a Linux/Unix installation to APPX 5. Warning - These instructions specifically apply to upgrading from APPX 4.2.a to APPX 5. If you are upgrading from an older release of APPX, these instructions may not be applicable. You should consider upgrading to APPX 4.2.a first and then upgrading to APPX 5. Verify the integrity of all files in your system and correct any errrors. The first step of upgrading your APPX 4.2.a installation to APPX 5 is to convert your System Administration files to the new APPX 5 format. The System Administration files for APPX 4.2.a are not compatible with APPX 5 and must be converted to the APPX 5 format. Log in to your Linux system as the "root" user. Download the installer for the APPX 4.2.a to APPX 5 upgrade application (APPX4to5upgrade_linux.sh for Intel based computers running Linux, or Appx4to5upgrade_risc.tar.gz for RISC based computers) from the APPX web site or the APPX ftp server and save it to your Desktop or to any other suitable folder. Change the permissions on the downloaded installer file (APPX4to5upgrade_linux.sh) to have Execute permissions. Run the installer file (APPX4to5upgrade_linux.sh). If you are presented with a "Run or Display?" screen similar to the one below, click on the "Run" button. 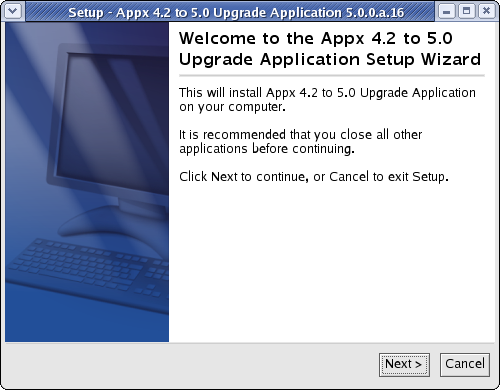 After a few moments, the APPX 4.2 to 5.0 Upgrade Application Setup Wizard should display the Welcome screen. Click on the "Next" button to continue. Read the Installation Instructions and then click on the "Next" button to continue. Specify the Destination Directory into which the upgrade utility is to be installed. The directory that you specify must be the directory where APPX 4.2.a is installed on your system. As a matter of convention, this directory is usually "/usr/local/appx/". The APPX Upgrade Application (5SA Version 00) will then be installed into the specified destination directory. When the installation wizard displays the final screen, click on the Finish button to end the installation wizard. If you don't have access to a GUI you can run the this installer in character mode by appending "-c" to the command line. After a few moments, the Appx Setup Wizard should display the Welcome message. Press Enter to continue the installation. This will install Appx 4.2 to 5.0 Upgrade Application on your computer. Next, the installation and conversion instructions will be displayed. Press Enter when you are ready to continue. into place as your live System Administration files. 1. Install conversion application into your current appx installation path. 2. Add application 5SA version 00 in System Administration - Applications. 3. Add database 5SA connected to Application 5SA 00 in System Administration - Databases. 4. Process the Data Dictionary for application 5SA 00. 5. Create data files for Database 5SA, application 5SA. 6. Run application 5SA, database 5SA and follow the on screen instructions. Choose the location for the installation. Where should Appx 4.2 to 5.0 Upgrade Application be installed? After installing the Upgrade Application, you must run APPX as an APPX System Administrator and configure the Upgrade Application. Add the upgrade application (5SA 00) to the Applications file. Add the database (5SA) for the Upgrade Application to the Databases file. Run Database Management for the Upgrade Application and Database. After configuring the Upgrade Application, you must run the Upgrade Utility to convert your System Administration files. Click on the "Convert" button to run the conversion utility. The conversion utility will create a log. Specify the appropriate disposition options to print the conversion log. The conversion log will inform you of any problems that may have been encountered while running the conversion utility. Before you install the APPX Utility, you must first replace your old System Administration files with the new System Administration files that were created when you ran the upgrade utility to convert your System Administration files to the new APPX 5.0.0 structure. You can use a "cp" command similar to the example below to replace your old System Administration with the upgraded files. Be sure to edit the copy command to reference the directory where APPX is installed on your system if APPX is not installed in "/usr/local/appx". You should also remove the System Administration structure files. You can use a "rm" command similar to the example below to remove your System Administration structure files. Be sure to edit the rm command to reference the directory where APPX is installed on your system if APPX is not installed in "/usr/local/appx". Creates an O/S user named "appx" and a group named "appxgrp". Creates the destination directory and installs APPX into it. Log in to your system as the "root" user. Download the APPX/Linux GUI installer (appxsetup.sh) from the APPX web site or the APPX ftp server and save it to your Desktop or to any other suitable folder. The following instructions will refer to the appxsetup.sh file, which is the name of the Linux installer. The installers for other operating systems have similar names, ie, appxsetup-aix.sh for AIX, appxsetup-sun.sh for Solaris, and so on. if you are downloading directly from the ftp site, make sure you choose the correct installer for your O/S, and substitute your installer's name in the following instructions. Change the permissions on the downloaded installer file to have Execute permissions. Run the installer file (appxsetup.sh). If you are presented with a "Run or Display?" screen similar to the one below, click on the "Run" button. After a few moments, the APPX Setup Wizard should display the Welcome screen. Click on the "Next" button to continue. Specify the Destination Directory into which APPX is to be installed. As a matter of convention, APPX is usually installed into /usr/local/appx but may be installed into the directory of your choice. You will be warned if the destination directory already exists. Otherwise, the APPX Setup Wizard will create it. APPX will then be installed into the specified destination directory. When the APPX Setup Wizard displays the final screen, click on the Finish button to end the APPX Setup Wizard and to automatically run APPX to complete the configuration and installation of APPX. When you click on the Finish button, an APPX session will be automatically launched to run APPX to complete the installation of the APPX environment. Finally, if you intend to log into APPX as user "appx", then you must add a password for the "appx" o/s user that was created by the installer (use the "passwd appx" command). After completing the above steps, you should be able to login to APPX as user "appx" from a remote desktop using the ADC. If you don't have access to a GUI, you can run the Appx installer in character mode by appending "-c" to the command line. After a few moments, the Appx Setup Wizard should display the Welcome message. Press Enter to continue the installation. This will install Appx on your computer. Next, read and accept the License agreement. Press Enter as each page is displayed. Please read this carefully before you click on the Accept button. "Software License Agreement (SLA)" shall mean this Software License document and the associated *License Key document collectively. After the agreement has been displayed, enter 1 to accept the license agreement, or 2 to cancel the installation. Choose the directory where APPX should be installed and the other installation options. Where should Appx be installed? Create a Quick Launch icon? Log on to your Linux system as a user who is an APPX System Administrator. Then start a local APPX session by running client-local.sh. You should be presented with the following System Registration screen. Notice that the Effective Date field on this registration is blank. Starting with APPX 5.0.0, all License Keys include an Effective Date. You must install an updated License Key before you will be able to run APPX 5.0.0 or higher. Note that in Release 5 and higher you can copy your registration to the clipboard, and APPX will detect it when you choose "Typical Import" from the "Import Menu" below. After installing a new 5.x License Key, your System Registration screen should include an Effective Date. APPX 5.0.0 includes the new APPX Login Manager service. This service replaces the Connection Manager (appxd) which was included with APPX releases prior to APPX 5.0.0. The old Connection Manager will not work with APPX 5.0.0 and should not be used. You should remove appxd and start-appxd.sh from the tools directory since they are no longer needed. You should also remove any commands that might be run to start appxd during the boot process. After executing the above command, users should be able to use the APPX 5.x Desktop Client to successfully login on port 8060. For additional information on managing APPX Login Services, please refer to the complete documentation. Review your 'appx.env' file. Ensure any settings you still need are there. However, remove any obsolete settings. In particular, do not set APPX_42_EPS, this will cause system wide problems with Page Up/Down. Create the new System Administration files ("System Administration/File Management/System Admin Files" on pull down menu). Run 'Load Initial Audit History' for each of your applications. This is optional, as APPX will automatically build the history as you make changes to your application. For example, the first time you go into INPUTs, APPX will see that the audit history is missing and it will create it as it reads the input process records. Regardless of whether you run this, APPX will start keeping a detailed audit history of changes in applications from this point on. However, you should decide now whether to run this step now or not. If audit information already exists in the audit file when you run this step, it will duplicate the data. Run 'Sync Design Elements' for each of your applications. Did an AIX upgrade, ran into the following: - when using the character installer, the permissions were not set. Had to manually change ownership & set sticky bit. - using 'ssh -X user@host' and then trying to run either client-local or client.sh did not work. The ADC would hang at 'Negotiating GUI something or other' - When trying to create new Sys Admin files, got error about Invalid Prototype Record Length on SYSDFLT. Scratched all Ems/Dbgs for the 0-apps and problem went away.